Example of Alan's Douglas 90 Plus. Alan purchased his very first bike, the Douglas 90 Plus flat-twin, back in 1950 for £21. He enjoyed riding on the road but his real motorcycling passion was only just getting going. Back then the village of Tottington didn't offer much in the way of entertainment, but one of the favourite past times of many was turning out to watch the motorcycle skills of Derek Brooks. 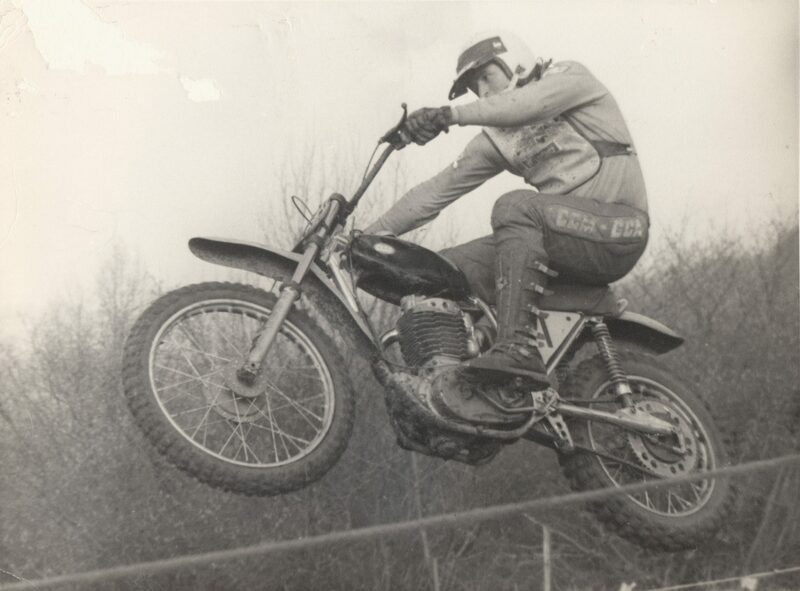 Derek was a brilliant trials rider, and being only a few years older than Alan, it didn't take long for Clews to start having a go at those tricks on his Douglas. Gail, Raine & Baby Austin. Around the start of his racing career, young Alan still managed to have a life outside of work, and soon after meeting local lass Gail got married. He left his job with Steens and went to work with Gails family who ran newsagents around Bolton and a stall in Atherton's market. Together he and his new wife expanded the business and began a family. 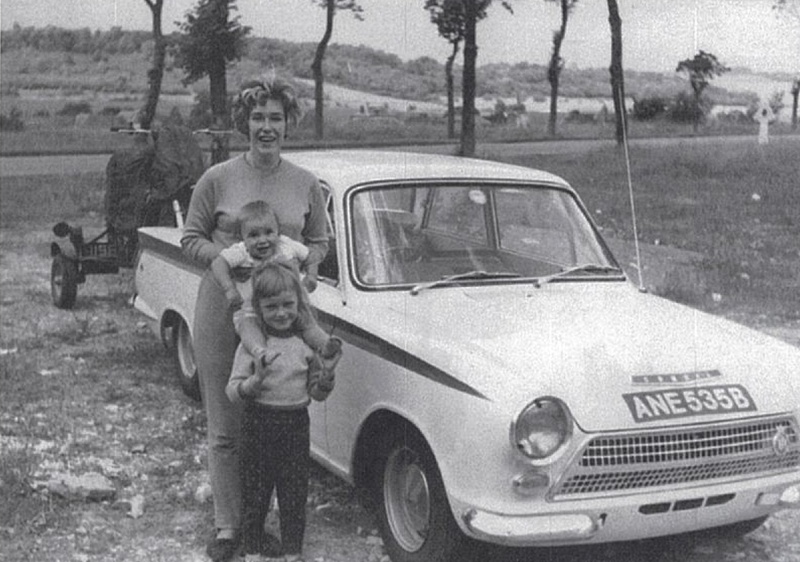 Raine was their first child, followed by Austin in 1964. Rheims, Alan Clews' first Continental race and second place. 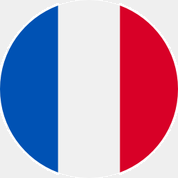 Clews finished second at his first Continental race at Rheims. "The track was very slippery, and people were falling off all over the place" he says. "Then the French champion came up behind me, shouting at me. They'd do that to put you off and make you think there was something wrong with your bike, then he passed me". A few days late Gail and Austin drove to another meeting on the west coast where the conditions were very dry and dusty. Alan commented "the other riders dragged their feet to kick up dust so I couldn't see which way to go. By the time I finished the lap, the leader was behind me again". Still, second place in his first French race wasnt a bad beginning, especially when it brought £50 start money and £80 in prize money, complete with a large crate of champagne (drank before return, to avoid customs issues). How it all began, the Clews Stroke 600cc wasn't badged as a CCM. By the early 1970's BSA was on its last legs. Its trumpeted new road bike range for 1971 had been a total flop and the company was now in serious debt. Within a few years the giant Small Heath plant would be no more, and being desperate to save money, BSA announced the closure of its competition department. Recognising an opportunity, Clews immediately got on the phone to manager Brian Martin and the pair drove down to Small Heath. They returned with around a dozen frames and other motorcycle parts for the tidy sum of £750. Now Alan had the means to build a full batch of bikes, mostly for sale, but he always had the idea that he would keep at least one for himself. Still working full time in the family business, Clews realised he was going to need help building the first batch of seven motorcycles, and took on his first employee, Martin Hemingway. Martin was a civil engineering student that had a summer job working at one of the Clews' shops, and turning out to be very good at wheel building, Hemingway would become one of CCM's longest-serving employees. Shiffnall Street, Bolton - Cheap but very small. Alan and Gail sold one of their shops and rented out a two-storey factory on Shiffnall Street in Bolton. It wasn't in the most illustrious part of town (it was actually known for being in the red-light district), but the rent was a mere £11 a week. Martin Hemingway soon joined the pair, moving from shop work to the new factory, which was converted in the first few months of 1972. 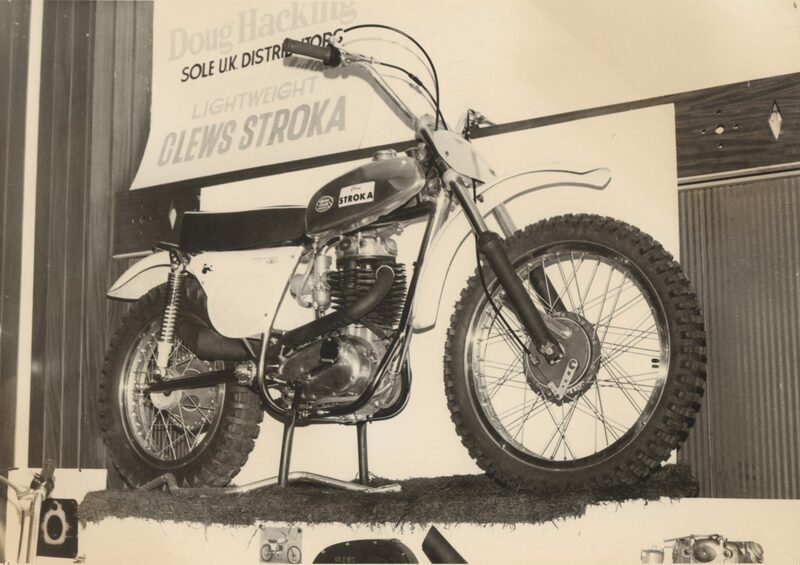 At the same time the company was registered as Clews Competition Machines, and the Clews Stroka name was eventually dropped. Clews maintains that he chose 'Machines' and not 'Motorcycles' in case they ever decided to build a different type of vehicle one day. Either way, he soon heard from an indignant Canadian bicycle maker named CCM. 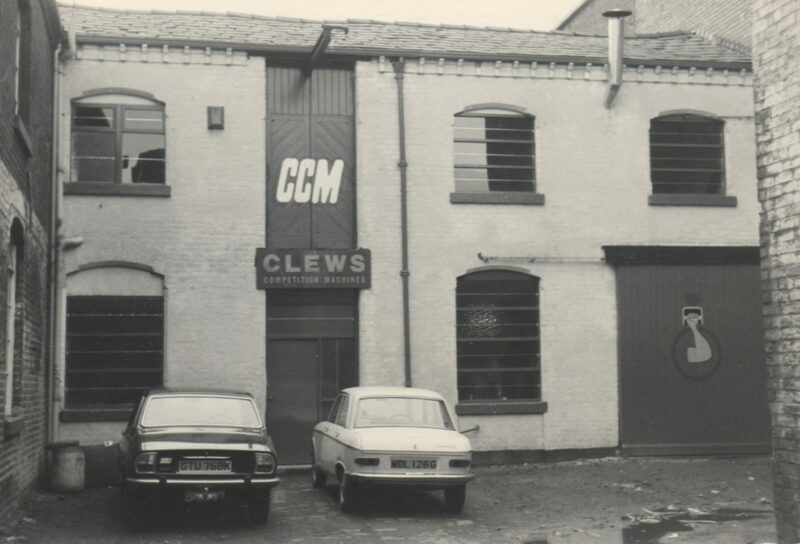 The Clews company became CCM Britain Ltd and everyone was happy. A man in his element - note the gaskets and O-rings within easy reach. 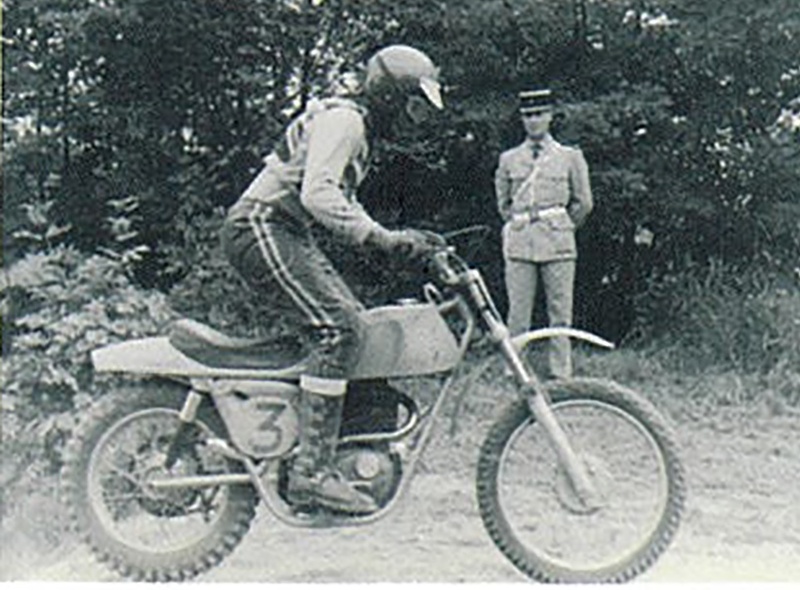 There were some revolutionary changes to the CCM motocrossers during 1973, most notably to the suspension. The forks (still very much based on B50 components) went up to 7.5 inches of movement thanks to another inch added to the dampener road. At the back, the Girling shocks now delivered 7 inches. In the same year Fred Stoneham started his own business as an ignition expert and he visited Shiffnall Street promising to make an electric egnition that would alleviate issues with ignition reliability. He delivered on his promise according to Clews' exact specifications and creating a much more reliable system. Other radical changes would have to wait since Clews was determined to run a factory team in motocross events. It was a brave and expensive move for such a young company, however would provide the perfect platform with which to demonstrate what these bikes were capable of. Vic Eastwood signs back up as a works rider and heads off to follow in the footsteps of of Bob Wright, competing in the Trans Am series in the United States. Partly funded by the factory, and their new U.S. importer Martin Horn, Vic unfortunately didn't get the race results they wanted. 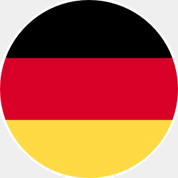 Regardless, the CCM bikes fired interest in the States, and Martin Horn came up with a order for 26 bikes, paid for in advance. The new year started well with the racing a sporting show in London. The latest production CCM was closer than ever before to the works machines, and new forks were prominent among the changes. The standard 500cc engine was changed too. The short-stroke 88 x 82mm unit has served well but was prone to small-end wear when ridden hard. Clews' solution was to revert to the original B50 dimensions of 84 x 90mm, with a smaller, lighter piston. This also ensured the bike retained the same capacity, had a smoother mid-range and ultimately was more reliable. 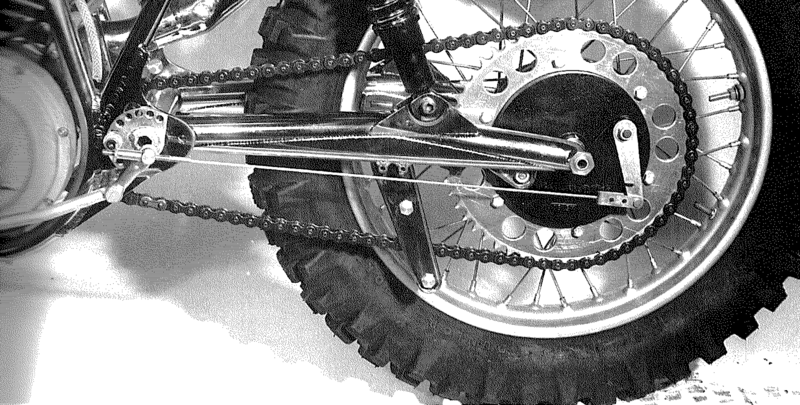 With further changes such as new suspension, modified frame, and a reworked engine, the 1975 CCM was radically different to the 1974 model, and orders to produce at least 170 bikes a year for two years were taken. 1976 was off to a busy start, with Vic Allen (the man to beat the year before), approaching Clews and asking for a factory ride, although he did come with a high price tag. 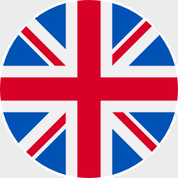 To pay for it, CCM Team Britain was formed. 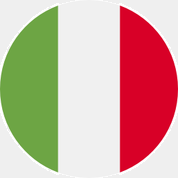 The idea was proposed by journalist Martin Christie who suggested that CCM, with proper sponsorship could mount a major campaign in national and international events. It says a lot about the company reputation when they attract such big names to sponsor them such as Castrol, Camel Cigarettes, and LPS Lubricants. Hiro-engined CCM from 1979. This is a 250cc. After the glory days of CCM Team Britain, and the presence of riders like Vic Allen and John Banks, the competition story was much quieter in 1979. 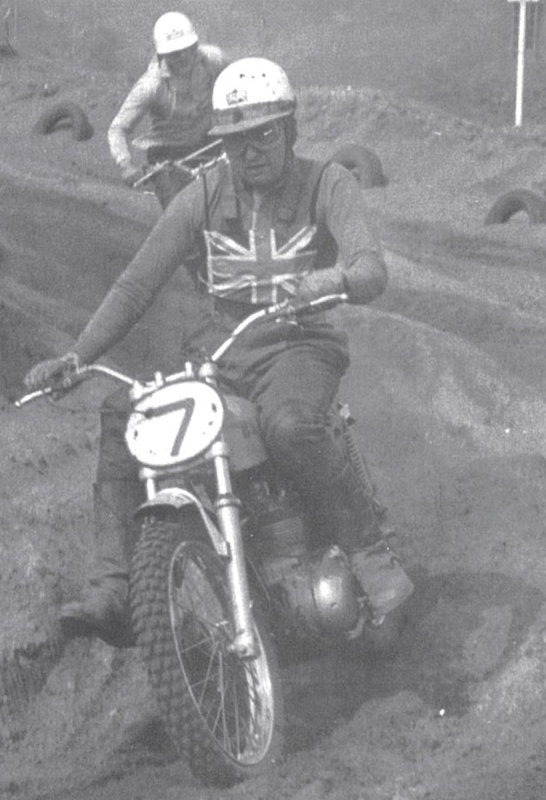 Big John and Vic Eastwood left to develop other motocrossers, leaving Bob Wright as CCM's sole works rider. 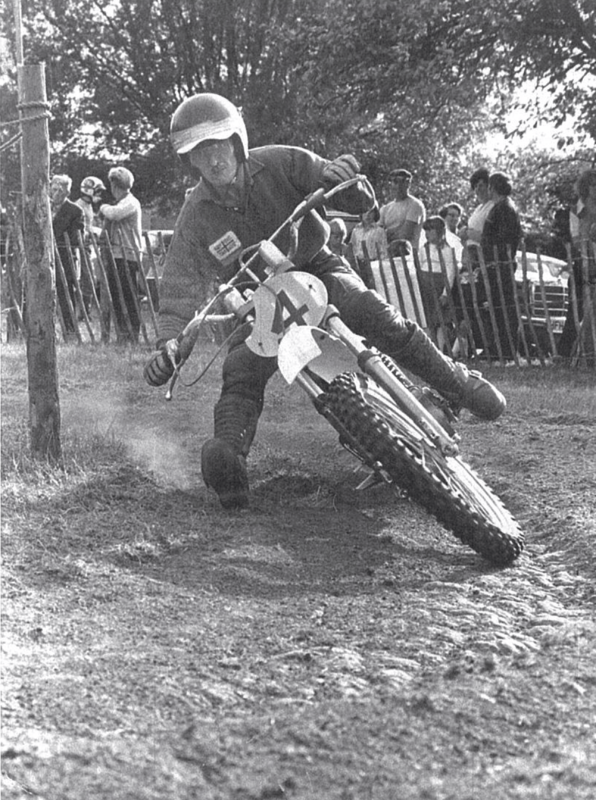 Jimmy Aird was still a supported rider, but the consistent Norman Barrow had moved to a Maico. It wasn't a great season for CCM and until the last British Championship round Wright's best place was a fourth. But it all came good at the final British Championship meeting, with Wright scoring third in the first leg. He led the second leg for five laps before he fell off and stalled, though he remounted and gained another third. He was eighth overall, but that didn't seem to matter to the CCM buying public and Wright's replica bikes sold very quickly. 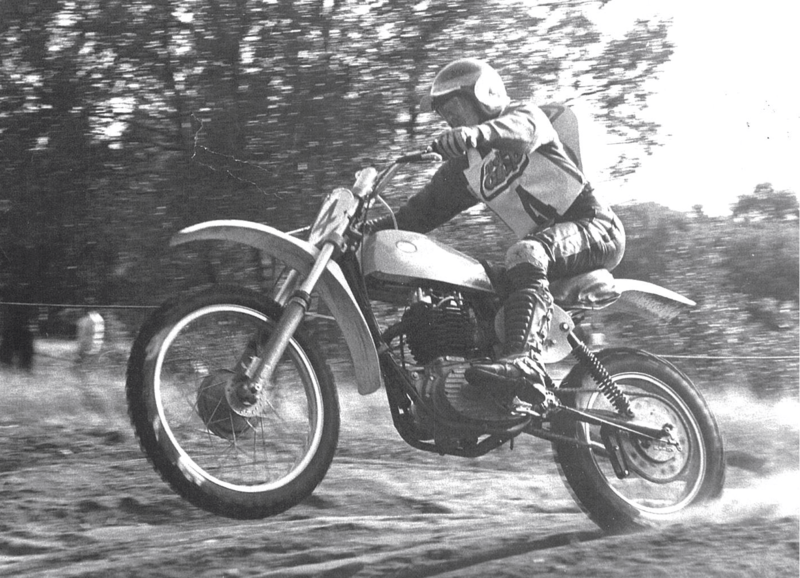 Young Allan soon found the heavy road-going Dougie to be unsuitable and made the decision to move onto his first trials bike, a Villiers-powered James, from Cliff Holden's shop in Bury. At £108 it had to be on hire purchase for the young apprentice and his mother had to sign the finance forms when Clews Senior refused. It was a brilliant move, for in addition to working days at Steens and studying for his ONC's, clews managed to find time for intensive trials practice on his James. He began entering local events and did well, winning some Centre trials and finishing runner-up in the North West Centre championship, more than once. The James was later replaced by a Triumph Cub (then another one) before he bought an Arial 350 that he modified in many ways, converting it to oil-in-frame spec and shedding a lot of weight. 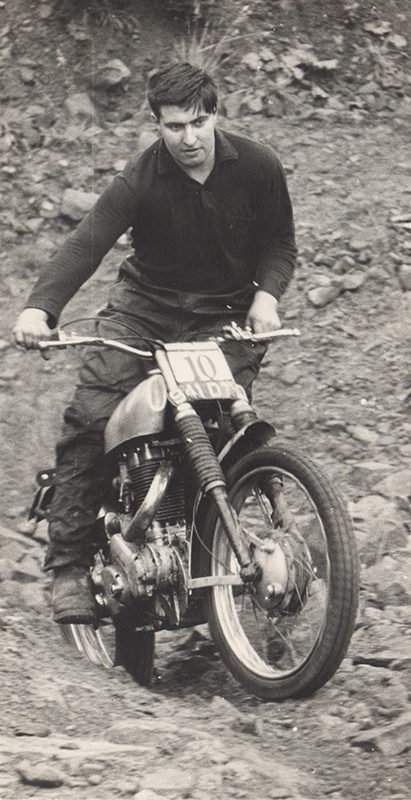 A young Allan Clews pilots his Ariel 350 - It taught him a lot. 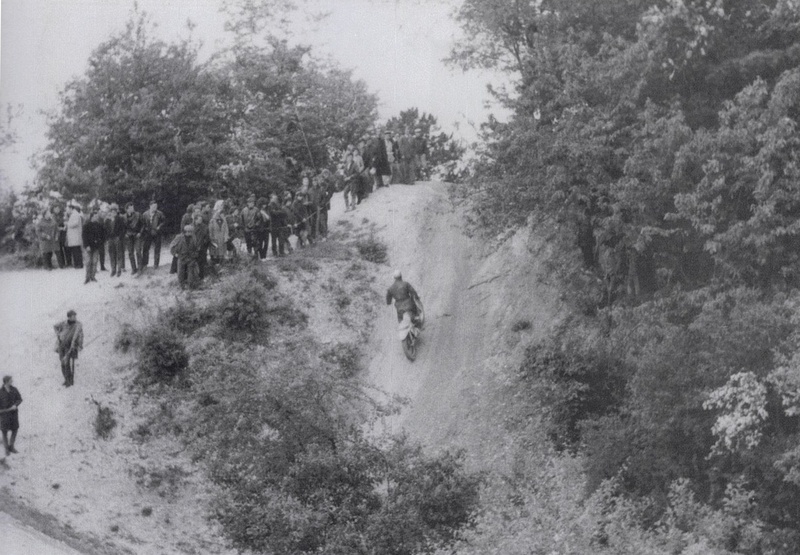 Things were going well for Clews and for the first time Alan could afford to follow his dream of riding scrambles on the continent. In those days, competing in France was the 'Holy Grail' for English riders. Not only was there the glamour of foreign lands, long road trips, and big crowds, there was also the allure of the generous start and prize money too. From the cold north of England, it meant a 1,600 mile round trip, but Clews was determined to give it a go. 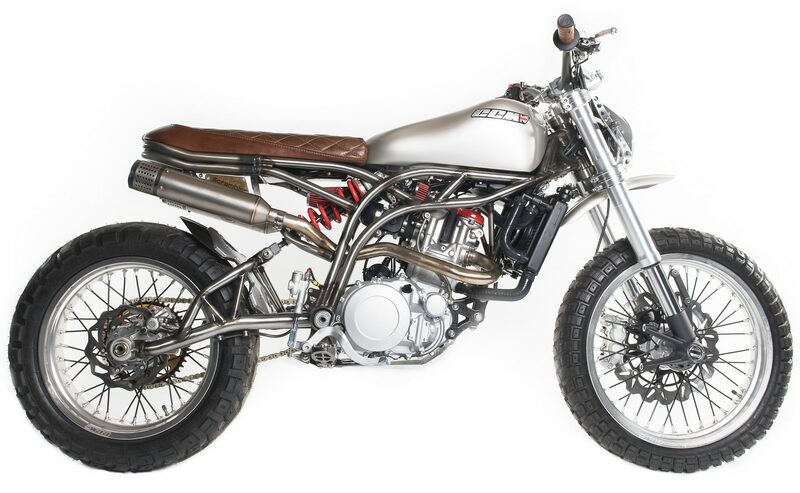 He abandoned the trials scene and built his own Scrambler using a new Matchless G80C engine, in a Rickman Metisse frame kit. Riding in European Scrambles opened up a whole new world. The Metisse worked well, but what Clews really wanted was a works BSA 500cc Scrambler, but the issue was BSA refused to sell him one. This wasn't a too serious of an obstacle for the man who'd already built his own bike. He was able to get hold of ex-works cycle parts, and in place of the engine, stretched a 441cc Victor engine to 490cc by increaing the stroke to 100mm (from the standard 90mm). 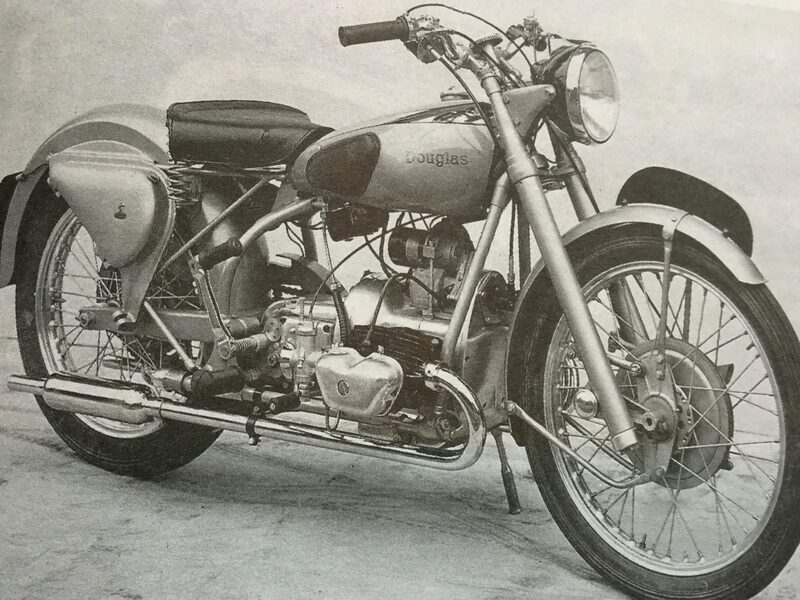 It was the first of many variations of the BSA four-stroke single he would produce by juggling bore and stroke. An alloy tank and fibreglass mudguards were employed to finish the bike off, leaving it looking like a professinal machine. Clews never got to ride that first machine, as someone made an offer for it soon after completion. Amused Gendarme watches Alan on the Matchless Matisse. That very first batch of bikes was called, Clews Strokas. One of the very first, delivered in April 1972 with frame no.B3, used a B50 engine, and was bought by Mike Barnes. He soon bought himself another, this one bored and stroked to 608cc, which he later recalled was the quickest bike around that time. He won several races in 1972 and later that year Clews displayed the 608cc bikes at Belle Vue stadium in Manchester for £595 a piece. 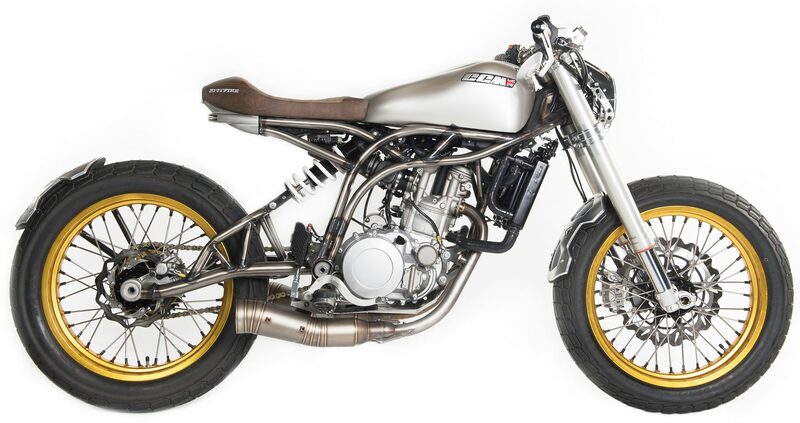 By this time it was clear that Clews could sell more of the Clews Strokas than he could make, so he took the decision to become a full-time bike builder. It seems to be an obvious move now, but at the time the risk of leaving a successful family business for something quite different, would be too great for most. He had only a finite number of engines and works frames and there was no guarantee that the demand for Clews Strokas would continue. Early advertising was modest and Doug Hacking was the sole dealer. 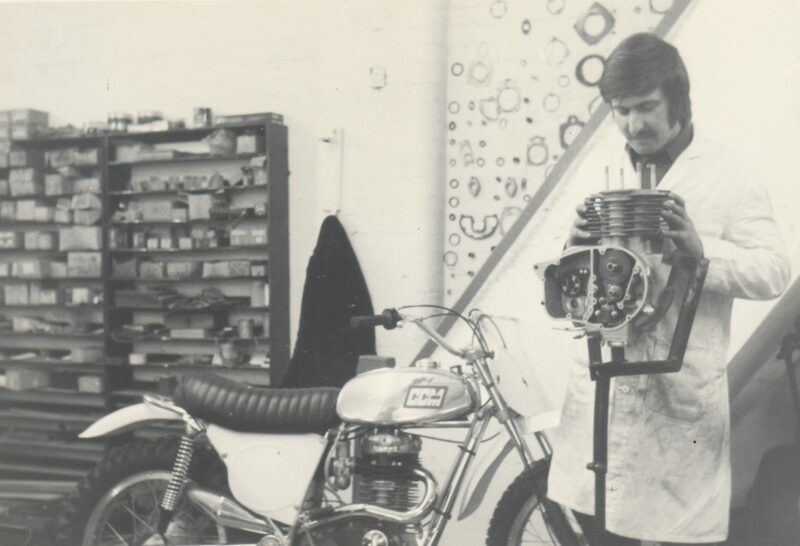 The biggest worry for Alan was in securing more motorcycle engines and frames, but BSA later relented and agreed to sell a batch of disassembled B50 power units. 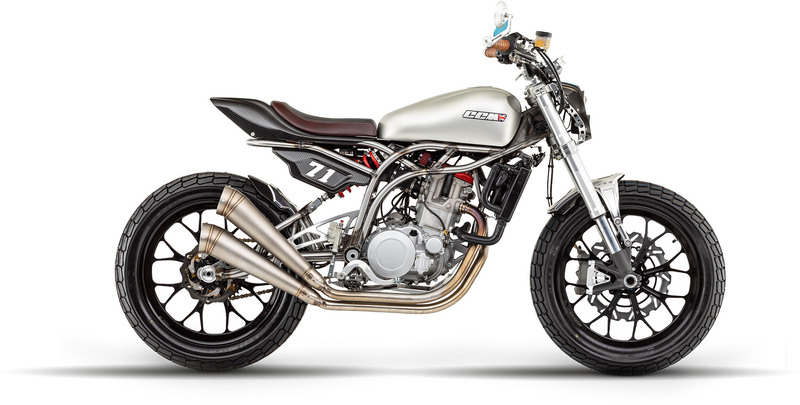 This was a nice surprise, given that the Clews Stroka was in direct competition with BSA's own B50MX. 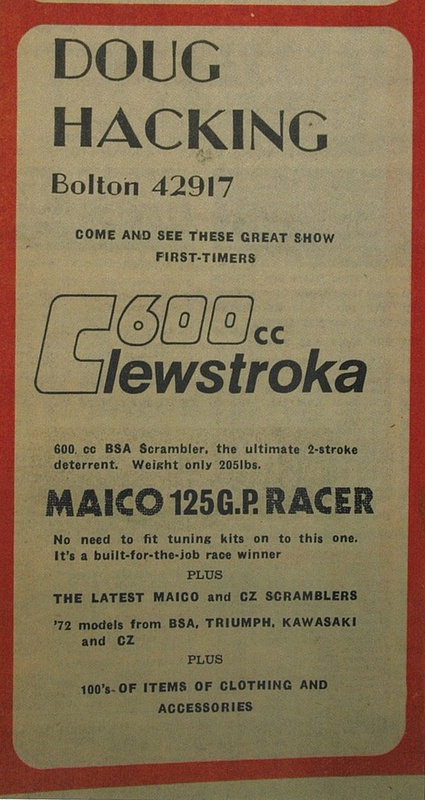 On the other hand, someone at BSA has probably recognised that Clews's quick Scramblers were doing the beleagured giant some good, and he was later asked to supply them with two of his modified engines to be used in speedway racing. The frame supply problem was solved one day, when out of the blue the phone rang and Mike Eatough asked if Clews would like to buy three frames that he'd just made. Eatough would be another key player in the CCM story. By the end of 1972 Clews and his small team at Shiffnall Street could look back with pride. They'd built and sold more than 40 motorcycles and were beginning to establish a reputation for quality, competitibe machines. 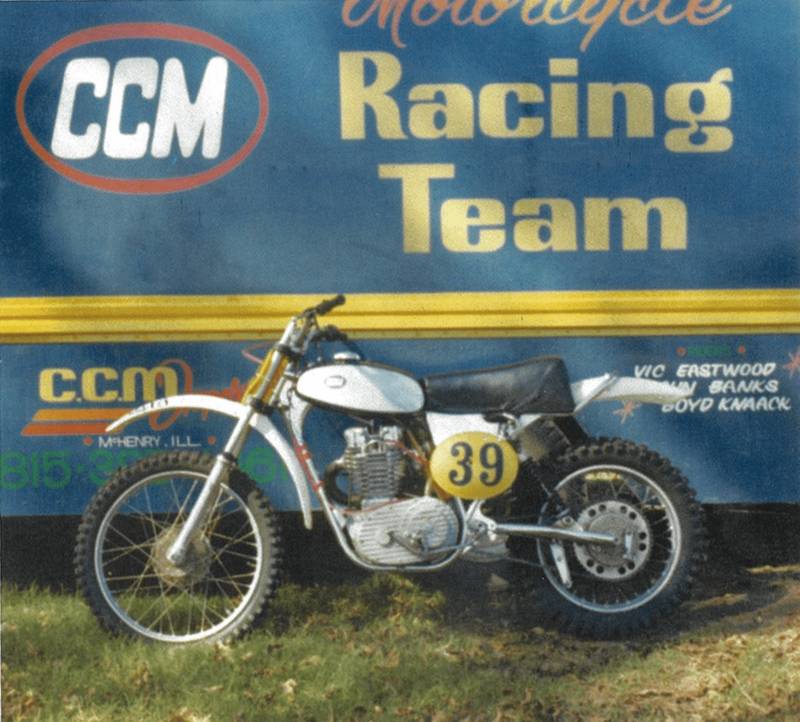 Perhaps even more of an achievement was the fact that just as the British motorcycle industry was collapsing, and many people thought the four-strokes were obsolete in modern motocross, along came CCM and put a British bike back at the forefront. 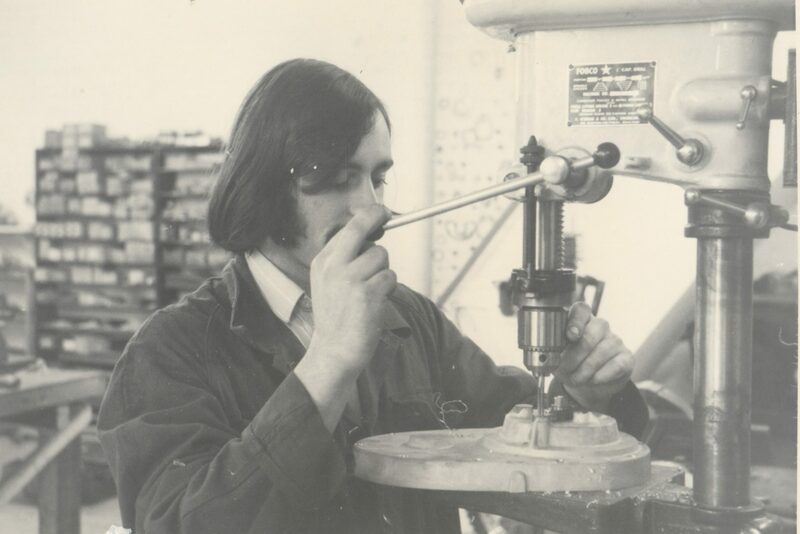 Martin Hemingway was Alan's first employee, and one of CCM's longest serving. Bob wright, Jimmy Aird, and Norman Barrow were all too young to have ridden in the four-stroke glory days of the 1950's and had all begun racing on two-strokes. 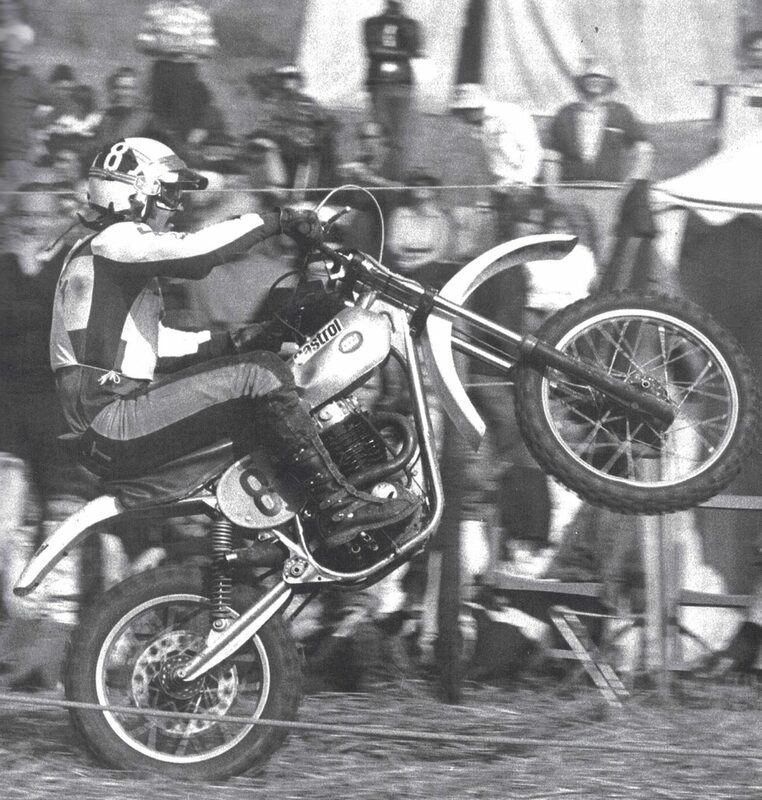 That being said, they all loved the lightweight CCM thumper, and Wright in particular would take to the short-storke 500, suiting his aggressive riding style perfectly. Wright was the man to bring home CCM's first victory back in 1973 at in Glastonbury, Somerset. He faced stiff competition and formidable opponents, including local man 'Badger' Goss. Clews recalled just how determined Wright was: 'I knew he was going to win when I saw him going up the big, bumpy hill. He was hanging on for grim death, and apart from his grip on the bars, most of him was off the bike for most of the time!' It was a glorious victory for the Bolton men, and was celebrated by a slap-up meal on the way home. It was followed up in October by another National win, this time by Jimmy Aird at Buith Wells. 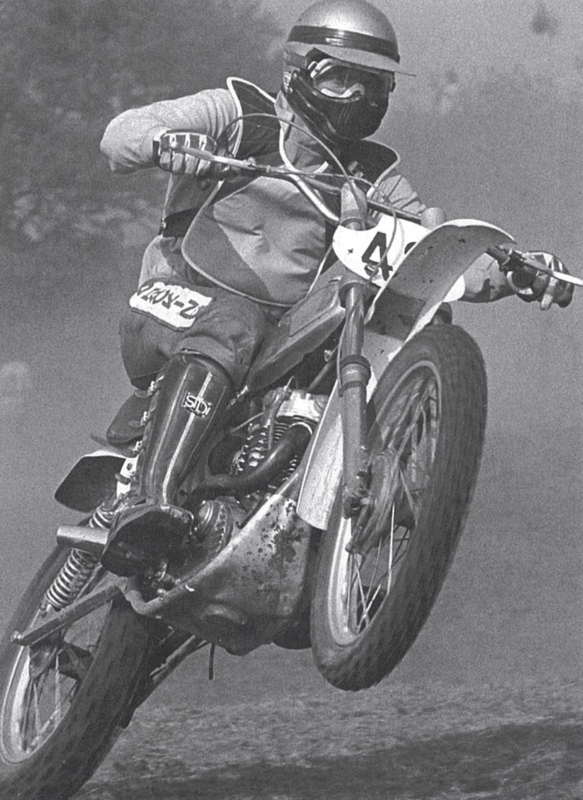 Norman Barrow in flight, 1973: He would be a staunch works rider for several years. In some ways 1974 wasn't the easiest year, but it had ended up with an increase in turnover and profits of £17,000, all of which was re-invested. 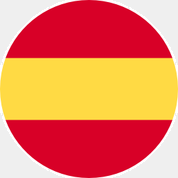 In fact, turnover almost doubled (thanks in part to the fledgling spare parts side business); 160 bikes were produced and once again well over half (54%) were exported. Vic had become increasingly demanding behind the scenes of the British Championship, however this had started to cause a little friction with the factory. He requested changes, modifications and three different engines, but the factory were struggling to meet those demands as they were focusing on production bikes alongside the race effort. On a more positive not, Eastwood was very fast. His first two rounds brought a third and fifth, but he won both races at Builth Wells, the third round of the British Championship. When struggling to find space to store the latest stock of ex-BSA equipment, Clews ended up leasing several small warehouses which was neither convenient, or cost-effective. The obvious answer was to find bigger premises where everything could be stored under one roof, and he found it in an old Courtaulds textile factory at Vale Street on the eastern edge of Bolton. Covering 20,000 square feet, this was huge and a world away from the £11-a-week factory on Shiffnall Street. Still, it had to be done, and Clews took a deep breath and paid £28,000 for it. This was just a start and CCM had to spend much more on refurbishing and getting the place ready. 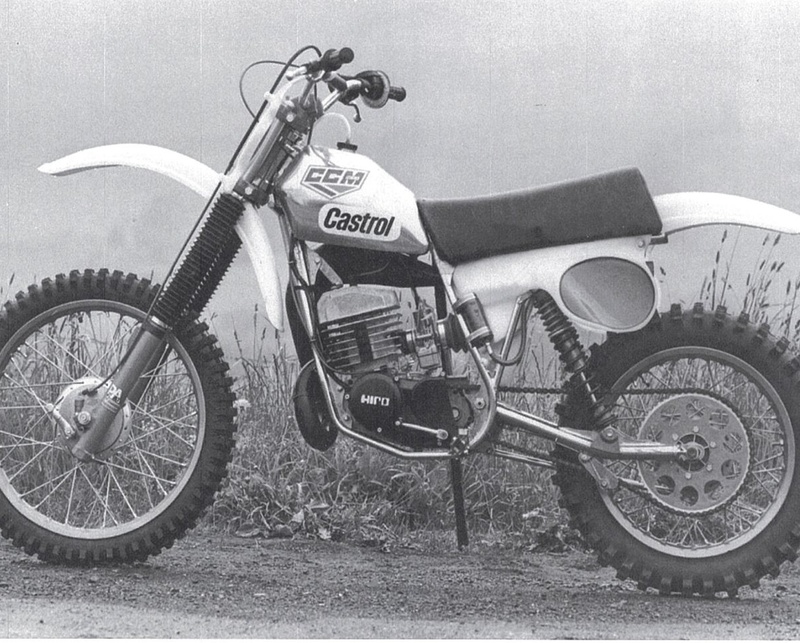 Launched at the dirt bike show in 1978, the big news was the 125 and 250cc Hiro-engined motorcrossers. For the first time CCM had a complete lineup of machines, but 1979 would turn out to be a nightmare year. 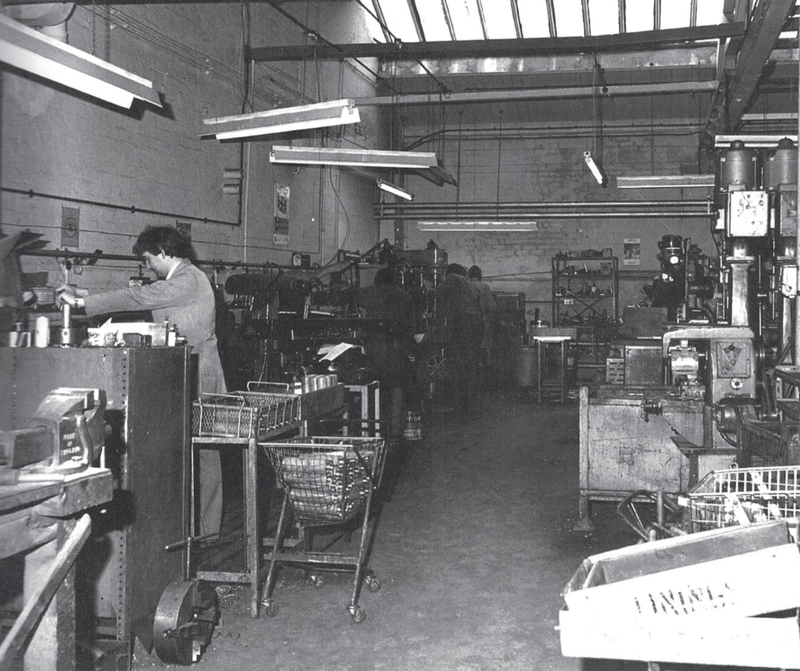 To accommodate the new range of bikes, the company had to expand, and the workforce increased rapidly. Starting with about a dozen in the original factory, to 25 at the new one, the 1979 payroll eventually peaked at 52; however, with the financial problems it fell back to 30 by the end of the year through natural wastage. 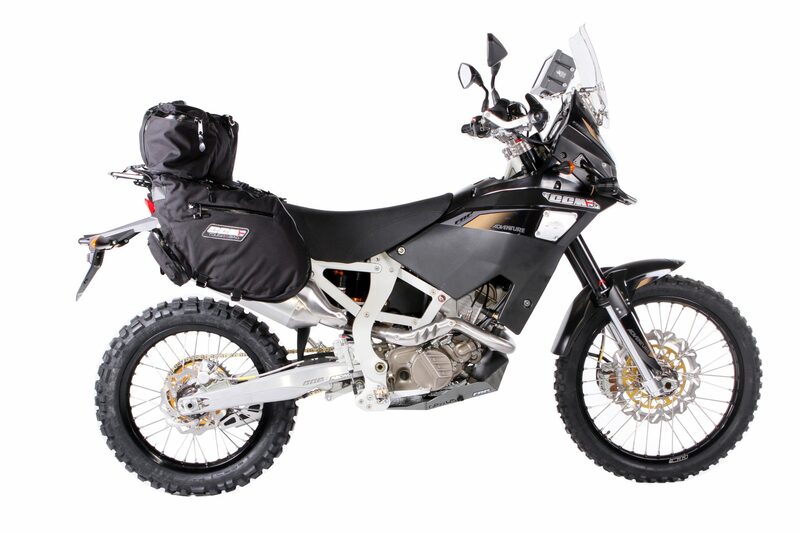 Production had planned to hit 70 bikes per month, a long way from the 20 bikes a month Clews traditionally stuck to. There were several reasons why 1979 was such a bad year, not least of them a tightening recession that affected the entire motorcycle industry; but one of the foremost was a delay in the launch of the Little Hiros, which then missed an entire selling season.